Nike Running Camp Director and Stanford Head Coach Edrick Floreal Named Assistant Men’s Olympic Track and Field and Cross Country Coach for the 2012 Games. Nike Camp Director and the Franklin P. Johnson Director of Track and Field and Cross Country at Stanford University Edrick Floreal has been named to Team USA's coaching staff for the 2012 Olympic Games in London. Floreal will coach the men's jumps as a member of the coaching staff under Men's Head Coach Andrew Valmon. 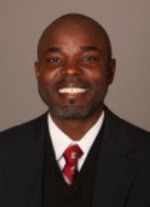 Floreal began his career at Stanford coaching the jumpers and continues to provide guidance to that group after being named the director of track and field in 2005. He welcomes both track and field running and cross country campers to the Stanford “Camp of Champions” this summer at The Farm. The Stanford University “Camp of Champions” Track & Field (July 7-11) is designed for athletes with the desire and special aptitude to become more competitive in an event. It is challenging and intense, helping the young athlete grow mentally and physically tougher for competition and training. Campers can choose from all disciplines: throws(shot put, hammer, discus, javelin) sprints, hurdles, middle distance (including steeplechase), and jumps (high jump, long jump, triple jump, pole vault). Note: Pole vaulters must bring their own poles. The Stanford “Camp of Champions” Cross Country (July 11-15) offers runners miles of challenging and pristine trails through the use of the campus and surrounding parks. During each run, the campers are placed in small compatible groups based on fitness and ability. Each group is assigned an experienced counselor, for specialized training and individual attention. Throughout the week, training and instruction are provided in breakout sessions taught by NIKE sponsored guest athletes and coaches. Campers during both sessions benefit from the opportunity to learn from a tremendous line –up of guest speakers, such as current Stanford student athletes, NCAA champions, Olympians, representatives from Stanford Admissions, a sports psychologist/nutritionist, and other notable Stanford alumni. At the Nike Running Camps, our goal is to stimulate a love for running and aid runners to become better, faster and smarter athletes. They provide an educational and inspirational experience for campers, ages 10-18, all skill levels and abilities. Players, coaches, parents and others interested in the 2012 Nike Running camps can visit the website or call 1-800-645-3226.